Brian Joubert (22) of France leads the men after the short program at the 2007 World Figure Skating Championships. The second day of the 2007 ISU World Figure Skating Championships continued with the Men’s Short Program. The 42 skaters were divided into two groups and a draw was made according to the ISU World Standings. The top 24 skaters from the short program will advance to the Free Program. Brian Joubert of France took the lead in the short program with a new personal best of 83.64 points. 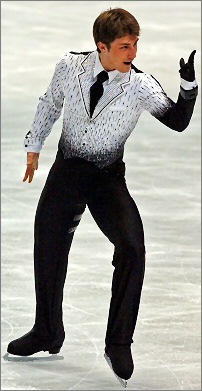 Skating to the soundtrack of Die Another Day and wearing a costume that included a gun holster on his leg and ‘007’ in sequins on his back, Joubert’s choreography mimicked the actions of James Bond. His entertaining program, which had the crowd clapping throughout, started with a beautiful quadruple toe loop-triple toe loop combination and triple Axel – both of which received +GOEs from the judges. All three of the Frenchman’s spins were graded level 4 and received +GOEs, as did both his level 3 footwork sequences. The only flaw in the program was a hand down on the triple flip out of footwork. The 22-year-old admitted to begin nervous until watching Stephane Lambiel’s short program. However, the Frenchman knows he’s not in the clear. Jeffrey Buttle of Canada was second with a new personal best of 79.90 points. With sublime interpretation of the intricate choreography to Adios Nonino by Piazzolla, the Canadian Champion held the audience in the palm of his hand as they watched spellbound. The Four Continents silver medalist opened with a beautiful triple flip-triple toe loop combination and a perfect triple Axel – both of which received +GOEs from the judges. The only imperfection in the program was landing the triple Lutz which was bent a little bit forward. Buttle’s intense circular footwork was followed immediately by a flowing straight line sequence – both of which were graded a level 3. All three of his complex spins were graded level 4. The 2006 Olympic bronze medalist had the audience on their feet in a standing ovation before he completed the final combination spin. Buttle told the press that he felt good and that his back isn’t hurting at all. Despite Buttle’s short season, he felt he made strides this year. Buttle feels If there is anything he has learned in the past few years is that he can’t focus on what other skaters are doing. “Obviously tomorrow I will just be focusing on what I want to do and what I can do and just let the card fall where they will,” said Buttle. Daisuke Takahashi’s superb skating skills and mesmerizing footwork captivated the crowd and he was awarded third place with 74.51 points. Skating to Concert for Violin and Orchestra by Tchaikovski, the Japanese Champion had a shaky landing on his first jump of a triple flip-triple toe loop combination, and underrotated the second. Despite the mistake, the 21-year-old recovered to land a good triple Axel. The 2006 NHK Trophy Champion also produced gorgeous flowing footwork right into a triple Lutz, followed by an expressive level 3 circular and straight line footwork sequence for which he received +GOEs from the judges. His ending level 4 combination spin had the crowd cheering and applauding before he was finished. Takahashi felt it was his worst performance of the season. The student from Okayama received positive energy from his home crowd but also felt some pressure. USA’s Johnny Weir came in fourth with 74.26 points and appeared cautious and slow in his King of Chess routinely. Although both of Weir’s footwork sequences flowed very well with the music, they were only graded a level 2 albeit with +GOE. The US bronze medalist delivered a beautiful triple Axel, but there was little flow out of the triple Lutz-triple toe loop combination and he stepped out of the landing of the triple flip. His spins, however, showed excellent position variations and were awarded level 4 with +GOEs from the judges. Weir was happy with his performance but admitted to feeling a little burned out coming into the event. Teammate Evan Lysacek came in a close fifth with a new personal best of 73.49 points. Skating to the dramatic, driving music of the Feeling Begins, Lysacek put a hand down and stepped out of a quadruple toe loop in combination with a double toe loop. Though his triple Axel wasn’t pretty, it was clean as was the triple flip. With the jumps out of the way, the Four Continents Champion started to express the music with his level 3 straight line and circular footwork as well as his level 4 spins, which were fast and had excellent positions. Lysacek had no regrets about attempting the quad. Stephane Lambiel of Switzerland finished sixth with 72.70 points. The current world champion had a dismal start in his routine to music from the Blood Diamond soundtrack, falling on a triple Axel as well as downgrading a planned quadruple toe loop-triple toe loop to a triple toe loop-double toe loop combination. Despite the mistake on the Axel, the Grand Prix Final Champion rebounded with an expressive level 3 circular step sequence and clean triple Lutz from footwork. The crowd was clapping as the music picked up and he performed a wonderful straight line footwork sequence using his whole body. His exquisite level 4 spins received +GOEs from all the judges. Lambiel confessed that he had not expected this level of performance. Debuting at the worlds this year, Canada’s Christopher Mabee came in at a respectable seventh with a new personal best of 71.33 points. The Canadian silver medalist showed no sign of nervousness as he skated a sultry and entertaining performance to Blues Deluxe by R. Stewart, opening with a beautiful triple Axel and triple Lutz-triple toe loop combination. The 21-year-old had to hang on to the landing of a triple flip, but otherwise produced two level four spins and a dynamic level 3 straight line footwork sequence. Sergei Davydov of Belarus opened his routine to Hymn to the Moon by Eugenia Manolides with a beautiful triple Axel followed by a triple Lutz-triple toe loop combination and a triple flip. The 2006 Cup of China silver medalists also displayed level 3 circular and straight line footwork sequences that flowed with the music, as well as a two level four spins, placing eighth with a new personal best of 70.72 points. Performing a light-hearted interpretation of Toccata and Fugue by Vanessa Mae, Tomas Verner of the Czech Republic delivered a good triple flip-triple toe loop combination, but then popped a triple Axel. The 2006 Nebelhorn Trophy Champion otherwise produced a triple Lutz, good footwork and three level 4 spins, earning 70.45 points for a ninth place finish. Alban Preaubert of France entertained the crowd with his Buzzy Bee routine, displaying playful level 3 footwork sequences, as well as three good level 4 spins. The 2006 Trophee Eric Bompardee Eric Bompard silver medalist landed a triple Axel and a triple flip-double toeloop combination, but struggled with the landing of a triple Lutz, placing tenth with 70.06 points. Canada’s Emanuel Sandhu finished 11th with 69.42 points. The 26-year-old opted for a triple flip-triple toe loop combination instead of a planned quadruple toe loop-triple toe loop combination. Despite a struggle on the landing of a triple Lutz and a fall on a triple Axel, he otherwise produced good level 3 footwork and two level 4 spins. Yannick Ponsero of France stands in 12th place, followed by Jialiang Wu of China. Nobunari Oda of Japan sits in 14th.